An outdoor entertainment area can bring you much enjoyment during the summer. Unfortunately, here in Madison, Wisconsin summers are short. When the patio is covered with snow, a finished basement can be the perfect venue for your guests. If you have the space, your basement can be transformed into a bar for entertaining, a game room, or a media room your family and friends can enjoy! Not that long ago, the basement was often relegated to storage, or maybe a workshop, pantry or laundry room. Today's homeowner has come to realize that the basement is a valuable space in the home that with a decent budget and a little planning can become a functional, usable space the whole family can enjoy... and you can still have plenty of storage and even your laundry room. At first, to many homeowners remodeling the basement generally meant adding storage, or maybe a spare bedroom. Today, while bedrooms are still a common choice, homeowners and designers have gotten creative. 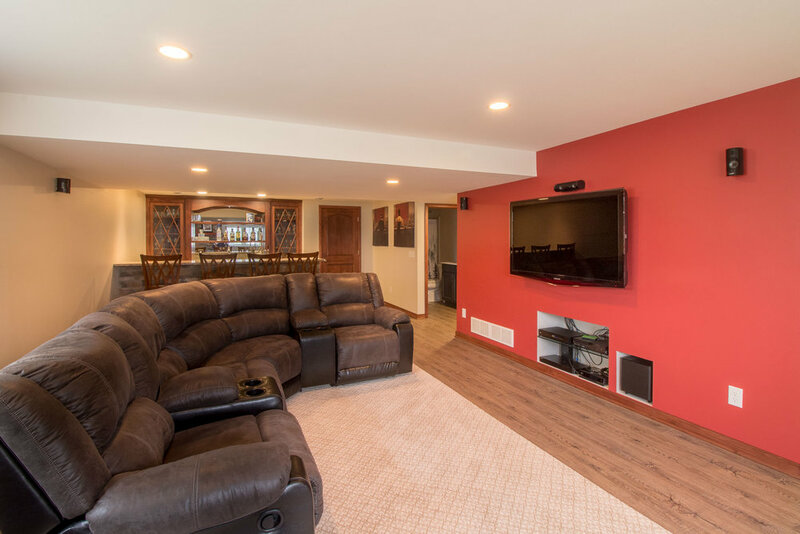 A finished basement is a perfect space for a game room, work out room, home office, theater, in-law suite, or even a personal museum to showcase your sports memorabilia and catch the game with your buddies. If you have the space, with a little planning, you might be able to have several of these options! A contemporary finished lower level design transformed this basement into an industrial chic space. The first step is to define your needs. Are you seeking a communal space for the entire family to enjoy or extra bedrooms for when family visits over the holidays? Are you considering moving your aging parents into your home or maybe a play space for your kids and their friends? Your finished basement is a blank canvas only limited by your imagination and your budget. Your basement is an extension of your home. Tailor your space for entertaining by having a bar installed. It's a way to express your personal style and using elegant materials. can tie it into the rest of your home. For example, match your granite kitchen countertop and add sleek leather barstools. Another option is to create a playroom that both the kids and adults will enjoy. Add a billiards table, air hockey or darts. For the kids, consider using chalkboard paint on one wall so they can go wild. Combine the kid's play area with a lounge in one corner so the adults can relax while keeping an eye on the kids. Working with a professional designer can help you to define your space, focus on your needs and explore all of the possibilities for a finished basement. A column was removed to create this open-concept living space in this finished lower level. Much like upstairs living spaces, an open concept floor plan in your basement gives you the most flexibility. A well designed open concept basement takes advantage of the natural expanse of the basement to create a modern style that promotes community and family. You can have multi-purpose spaces that are open to each other, like a game room at one end and theatre area at the opposite end separated by a wet bar. When it comes to designing a media room, homeowners have two options, an enclosed theatre or an open TV space. If you're a real film buff, imaging plush reclining seats, a projection screen and surround sound with LED floor lighting and even a popcorn machine. An open TV room is a more casual, less expensive option that can function as a second family room. Today, more homeowners are opting for the open TV space and integrating a kitchenette or bar to create a full entertainment area the entire family can enjoy. In the end, the choice comes down to your preferences and your budget. One of the hottest trends for 2018 involves creating a full guest suite including a full bath, bedroom, and a coffee bar or kitchenette. An in-law suite is a great option if your family comes to visit often or for extended periods. It gives everyone plenty of space and privacy. Or perhaps your parents are interested in aging-in-place. Invite them to live with you and create a wonderful multigenerational home! This finished lower level features a pair of 12-foot wide patio doors connecting it to the back yard patio. One of the hottest trends for 2018 is creating a “walkout” basement. It's a great option if your home is built on a sloping lot or hillside. This is a big job that involves excavating and exposing one side of the exterior and cutting in a door and windows. This can be a great option that allows you to open the basement to an outdoor living space or pool while allowing natural light to flood into your living space. This can seriously increase the value of your home. Make sure to work with a skilled and experienced contractor, and this remodel may need approval from your local building department. Ok, man caves seem to always be trending! If you don't want to turn the basement into a formal theatre, or in-law suite, consider a sports room with a wet bar. Your finished basement is the perfect area for a dedicated sports room. It's an out of the way spot where you can get rowdy without disturbing the rest of the house. It's big enough to gather all of your friends and family to watch the game and you can add fun elements like a kitchenette to prepare that game day feast. Your basement can add plenty of valuable living space to your home. Whether it's extra bedrooms, a home office, or a full-blown home theatre, adding a finished basement to your living space can give you years of enjoyment, and increase the value of your home. Consider the choice of words: Finished Basement and Lower Level. Which sounds more appealing to you? If you had the opportunity to finish a Lower Level, a space that feels a part of your home, isn’t that what you would choose? In this video Abe and Andrea will share some tips with you so that you can fall in love with your Finished Lower Level. This article was updated by Abe Degnan on 12/3/2018. If you're considering adding a finished basement to your home, give the experts at Degnan Design-Build-Remodel a call at (608) 846-5963. 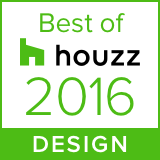 We can help you design the perfect space to meet your needs. Click here to schedule an appointment.